Written by: sarahwagner on March 24, 2016. 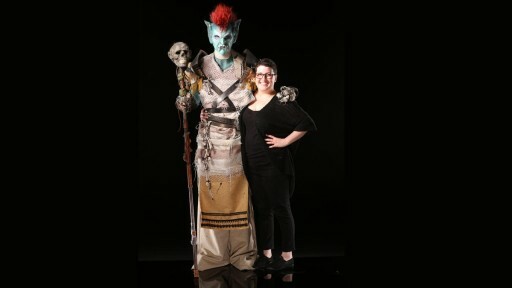 The episode opens as the contestants walk into the Face Off Lab to find it decorated with a large World of Warcraft statue and several other things. McKenzie gives an introduction of the game and the upcoming movie from Duncan Jones and Blizzard. 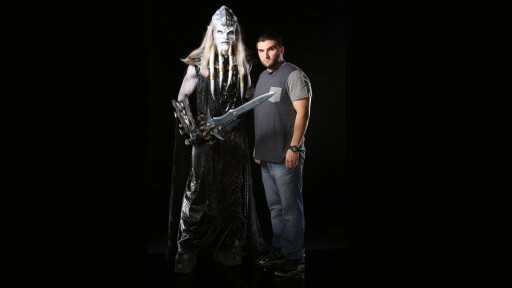 Tonight’s Spotlight Challenge will be adapting a World of Warcraft character to be more realistic. Melissa and Walter are both incredibly excited as they both play the game. 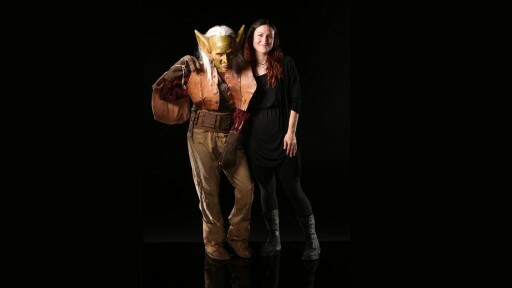 Before we get any further, McKenzie brings out a special guest, World of Warcraft Senior Art Director, Chris Robinson. The artists chose their characters quickly. Yvonne picks the Goblin. Walter takes the Draenei, which look to be the Warcraft answer to dark elves. Rob picks the Tauren, which has bull traits. Mel chooses the Troll. Melissa chooses the Worgen, a sort of werebeast character. I’m very sad that no one picked the Pandaren, the panda type character. At this point I should note that I do not play WoW and don’t know much about the characters, but I’ll do my best. McKenzie lets the artists know before the design phase begins that Chris Robinson will be sticking around for a bit to answer questions. The artists pick their models and get right to the design. Chris Robinson starts with Mel, who asks him a lot of good questions about the standard in game color scheme and style choices. Melissa doesn’t have much in the way of questions as she seems to understand the character, but they talk about the muzzle and the claws. Walter chooses to go the death knight path with his Draenei, and they discuss the tentacles and the tail. He urges Rob to make a good back piece as the profile is important to completing the character. Yvonne wants to combine the traits of the female and male in game goblins and Mr. Robinson is urging her not to go that direction as he explains that the female goblins are almost cute. After he leaves and everyone is getting to the sculpt phase, Yvonne makes it clear that she has no intention of listening to Mr. Robinson; and to me, that’s bad form as these are someone else’s ideas the artists are bringing to life, and it’s a bit like someone completely ignoring what a client wants in favor of their personal aesthetic. Mel and Melissa work together to get hand molds done as both of their looks need them. Walter is figuring out the tentacles before the sculpt using cotton batting and latex, and it’s actually pretty interesting. Melissa is really worried about her character’s texture. Rob is struggling with the back piece that will make the profile correct. Michael and McKenzie Westmore arrive to do the rounds of mentoring, and I’m a little disappointed that he is encouraging Yvonne in not sticking to the style of WoW. He tells Melissa to keep the shapes softer and add more to the muzzle. He tells Rob not to hold back as what he’s doing looks good so far. He tells Walter to keep the emphasis on the tentacles. He tells Mel that she has a good direction but she lost the frown along the way and she needs to take more from the source material. After the Westmores leave, everyone is even busier than before except for Rob who is incredibly unhappy with his work and focusing on the hands instead so he can mull over what to do with the other pieces. Day Two in the Face Off Lab begins as it always does, with everyone rushing to complete their tasks. Walter is really enjoying this and it shows. It looks like he is staying very true to the source material. Rob has figured out what to do with his face and completely scrapped the cowl, hoping to have time to fabricate the back that is integral to the accuracy of the character. Mel is discovering that she probably doesn’t have time to work with the hands. Everyone seems to be cutting out elements wherever they can, except for Walter who keeps adding elements. This is the first time we’ve really seen what an inspired Walter is capable of, and I think I’ve maybe underestimated him all season. Melissa gets one of her hands stuck in the mold, and she’s very upset about it. We’re seeing a lot of flubs and missteps tonight – much more than usual – and it makes me very nervous for the Reveal Stage. Walter is now fabricating a tail the same way he did the tentacles, with cotton batting and latex. Rob is working on the horns for his humanoid bull character. but in the end, only the broken horn got molded completely which could really mess up the final look. We get to see a moment out on the patio outside the lab where everyone is talking, most of them about not getting everything done but Yvonne is talking about missing her family. Day Three is Application Day, and the artists check the appliances and at least those things seem to have gone well. When the models arrive, the real work begins. Rob is a mess, and it’s looking like he’s not going to get finished with all of his pieces so hopefully what he does have will stand out. Melissa is working on paws but really, nothing is working right for her and her disappointment is visible as she really loved this challenge but hasn’t managed to be able to do what she wanted to do. Mel is laying hair, so much red hair. Yvonne’s idea to put the wig under the appliance and pull chunks through could go either way but I don’t see it being successful close up. Walter’s paint job looks like he learned his lesson from the last Focus Challenge as it is a similar color scheme and he’s really knocking it out of the park. At Last Looks I can’t help but be worried about Rob as he’s still my favorite this season and nothing is working the way he wants it to. I can only hope it is his perfectionism that is making him all sorts of doom and gloom and the work he’s putting out there will be better than he thinks it is. Melissa puts her model to work with a glue gun because she doesn’t have enough hands to get it all done. Yvonne looks like she might be flubbing her paint. Usually she pulls out a great paint job but this is getting muddier. Mel is feeling pretty confident again this week and that’s really great to see. At the Reveal Stage, McKenzie Westmore reintroduces the challenge and the series judges, Glenn Hetrick, Ve Neill, and Neville Page and their very special guest judge, star of Warcraft, Rob Kazinsky who apparently was once paid to play World of Warcraft and describes that year as the best year of his life. Yvonne: My opinion: The color looks weird and the goblin doesn’t look anything like what Chris Robinson described at all. Judges: The paint looks synthetic. She’s pretty for a goblin. The color is too pea soup. It’s a safe, muddy makeup. The face is too synthetic but she’s not dirty enough to be a goblin. Walter: My opinion: It looks like he made the picture we saw at the beginning of the show. The entire look is incredible and could easily walk onto a movie set as is. It’s amazing. Judges: Wow. Right on the nose. Accurate. Beyond expectations. Paint is good. Forms are great. Elegant interpretation of it. Nailed it. Rob: My opinion: the costume choice was so damned smart but I think he sells himself short too often. It is a bit too skinny/scrawny for the source material. Judges: Great forms. Very regal. Has great movement. It’s a beautiful sculpt. Good mouth. Best muzzled sculpture on the show (I disagree as I think they forgot Nora’s black sheep). The face is brilliant but it’s not a Tauren. Very inaccurate. Melissa: My opinion: Cuter than the goblin but it doesn’t say werebeast to me. It doesn’t really speak to me at all. Judges: Jowl feels inaccurate. It might be unfinished as there are some elements that look like they are maybe missing something. The profile is much better. It feels technically rough. Ears might be in the wrong place. The texturing is off. It’s not very realistic. Mel: My opinion: I like this. Fits the challenge. The teeth look they’re sitting weird though, like maybe the weight of the teeth is pulling on the lip. Judges: The warpaint is very cool. The hair is a spot on replication of the favored hairstyle of the WoW trolls. It’s successful. Beautiful profile. Purposeful. Like it stepped out of the game. I think it was really adorable how surprised Rob was to be put in top looks. He needs to stop doubting his skill and letting his perfectionism get the better of him.